Congratulations to "Martha L.", the winner in Constance's giveaway. Thank you to all who participated! About ten years ago, I saw an independent file entitled, Unbowed. The acting was poor, but the plot of the movie struck a chord in my imagination. In the post-Civil War era the American government forces a Native American male to attend a historically black college in an attempt to rehabilitate and assimilate him into American culture. One of the black students, a female, is both fascinated and repulsed by this Native American, who is unlike any male she’s known in her sheltered world. An attraction develops between the pair and they run off together at the end of the movie. I’m not going to analyze the subplots of the film but that pairing of two different cultures ignited my literary curiosity and over the next few days my mind played a ‘what if’ game. 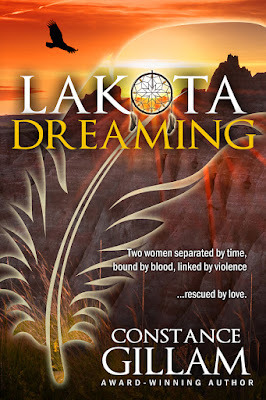 Lakota Dreaming, the first in the modern Lakota series, starts when a black corporate executive, Zora Hughes, tortured with visions of an ancestor, makes a trip to a Sioux Reservation to find out what happened to her forbearer. She gets no assistance from John Iron Hawk, the tribal police Captain. It doesn’t help that she lies to him about why she’s on the Reservation and he knows she’s lying. But the oral history of what happened to her ancestor has been passed down through the generations of one family. To protect the reputation of that family, the sole survivor will do anything, including murder, to keep those secrets buried. And Zora will do anything, including putting her life at risk, to learn the truth. Overhead, the early morning call of the hawks captured Julia’s attention as they sailed above the dry landscape, so different from her native Louisiana. The air held the promise of another fine September day. The sage-scented wind calmed her like her hus­band’s hands on her face after their early morning loving. At the river’s edge, she lifted her deerskin dress over her head and placed it with her fresh garments on a nearby rock. Walking slowly into the river, she allowed her body time to adjust to the shock of the cool water. She enjoyed these moments alone, away from the hate-filled eyes of the village, especially the women. But her babies would awaken soon and need to be fed, so she washed quickly, removing the smoke from the cooking fires from her hair. She submerged herself, allowing the water to close over her head. When she surfaced and cleared the hair from her eyes, a strange heavy mist surrounded the river. A figure stepped out of the vapor, and Julia’s heart pounded. She chastised herself. The stranger had to be someone visiting the village. Women did not wander the land alone. Julia smiled in shy welcome. The woman moved slowly into the water, never taking her eyes off Julia. Shunned by her husband’s people, Julia was happy someone now sought her out. Only when the woman neared did Julia see death—her death—reflected in the empty eyes. Zora Hughes surfaced from the dream, a scream frozen in her throat, her pulse swishing in her ears. A deflated airbag sagged across her lap. When she touched the thin and sur­prisingly soft fabric, images exploded in her mind: the deserted highway, the call, the deer. She jerked to a sitting position and blinked against the glare of lights that filled the SUV’s interior. A man stood outside her car. She swallowed her fear. “May I... may I see some iden­tification, please?” She sounded a little like Elmer Fudd as the words passed over her swollen lips. She was lucky. Swerving at the last second, she’d missed hitting the deer head on. Somehow she didn’t think the animal had been that lucky. She glanced up at the officer before checking out his badge plastered to the car window. Black hair peeked out from a Stetson he’d pushed off his forehead. Dark eyes stared back intently at her, steadiness and concern in his gaze. She opened the car door and stepped out into a night of sage and wildness. Her knees buckled, and he reached out a hand to steady her. “I hit a deer.” She peered through the darkness at the road behind them. She touched her mouth and winced, grateful the airbag had saved her from more serious injury. “Yes.” But was she really? The dream had left her a little woozy. She hauled out her overnight bag then extracted the items. Head bent, he quickly scanned them. His hair was long and pulled back from a rugged face. His street clothes gave her a moment’s qualm. “Are you off duty?” She’d read about people being stopped by phony police officers. He glanced up. Two vertical lines appeared between dark thick brows. Male musk and the smell of worn leather filled her nostrils. His voice held a hint of a smile. A smile she waited for and was disappointed when it didn’t materialize. Dark eyes held hers for a heartbeat, making the muscles in her stomach tighten. She glanced away. Constance lives in sunny Atlanta surrounded by her husband and five grandchildren. At 3pm every afternoon her writing day comes to a screeching halt when the school bus arrives and three of the five screaming memes burst through the door. Constance writes Romantic Thrillers and Mystery and dabbles in Young Adult fiction. Giveaway ends 11:59pm EST October 26th. Please supply your email in the post. You may use spaces or full text for security. (ex. jsmith at gmail dot com) If you do not wish to supply your email, or have trouble posting, please email maureen@justromanticsuspense.com with a subject title of JRS GIVEAWAY to be entered in the current giveaway. Hi, Deborah. I also love Native American novels. I'd be honored if you checked out the series. Let me know what you think. Thanks. 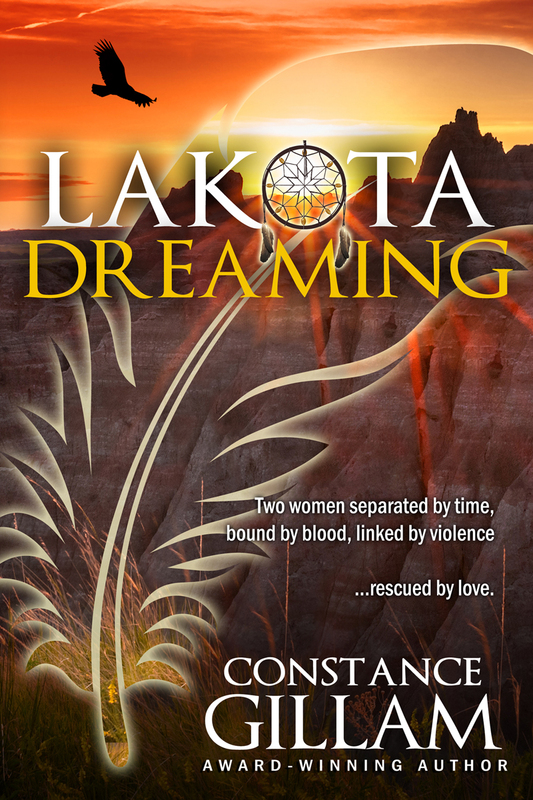 I hope you check out the Lakota series. I've enjoyed writing about John and Zora and life on the reservation. Such a unique premise. It definitely stands out. Looking forward to reading it! Thanks, Natalija. I'm glad you stopped by. It looks like you have had a lot of fun writing this series! And, congratulations. Thanks, Janet. Yes, it is the only book that seemed to write itself. Hello. This looks good. This is a new to me author. Love finding new authors to check out. Thanks for the chance. Christine, thanks for stopping by. I love finding new authors. Yes, I thought it was an interesting premise also. Thanks for stopping by. This one sounds like a book that I would love! Thanks for the giveaway. Hope you check the book out, Martha. Blending cultures is not an easy task. The people involved may do just fine, but the society they live in may not be so understanding or accepting. Intriguing blurb and excerpt. This should be an interesting and good read. I'm glad you find the blurb intriguing. This looks like such a great read.